Servicing dryers in timely fashion is one of our priorities at our company, Pay less Appliance Repair Santa Clarita, CA. Convenient when they are functional, these appliances can increase energy bills and become safety hazards if they don’t work properly. If you have any trouble with your home dryer, let our experts know. 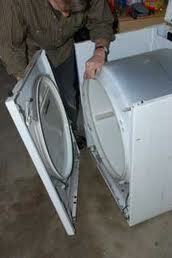 We provide dryer repair in Santa Clarita as soon as possible and can fix any problem related to these appliances. Rely on us to troubleshoot, but also routinely inspect and service your dryer. Trained to take care of these laundry room appliances, our specialists can install the new dryers and handle any issue with the existing ones. Share your dryer concerns with our team. Committed to helping our customers in Santa Clarita within a very short time, our professionals can cover every dryer repair need. When your appliance fails to latch or run, doesn’t produce enough heat or is overheated, the drum hardly spins or the clothes smell bad, the cycle lasts for long or the dryer makes noises, let us check the problem. With the right equipment and years of experience, our technician will fix the dryer parts and spare you the inconveniences and risks. Damaged dryer components, like thermostats, fuses, belts, switches or motors, are replaced. Most problems are taken care of on-site and rest assured that our technicians are trained washer and dryer repair specialists. Let us know if you need dryer installation. We make sure the new appliance is installed to your satisfaction and with respect to the local safety requirements. Our team can install and fix any type of home dryer in California and made by any brand. If you want to feel assured of its good condition and safe, trust regular dryer service to our professionals! When the dryer is used rather often, it should also be maintained frequently. Let us take care of such needs at your convenience. All home dryer needs are covered fully by our company!